Employee engagement with a referral program drives its success. This critical element demands that you consider how your program appeals to your employees. In many ways, you have to become a marketer and develop a positioning and messaging strategy that will attract and maintain interest in the program. The rewards that you offer successful referrers are a crucial part of this overall strategy. A study by WorldatWork found that 63% of companies offered some sort of referral bonus program. More importantly, 92% of those without a referral bonus program were looking at implementing a referral bonus program in the near future. That’s a little more than 96% of all companies that either have a program or want one. "Referral bonuses, used judiciously, may help agencies tap additional resources in their efforts to recruit new talent. Recruitment in tight labor markets can be particularly challenging. To meet this challenge, agencies are exploring the use of practices that have proved successful in private industry." What positions Merit a Referral Bonus? How much should you pay for specific positions? 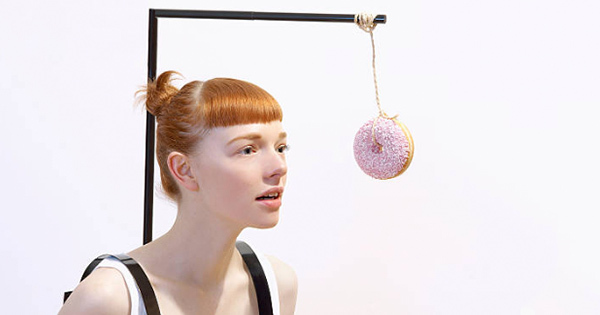 When should you pay referral bonuses? Looking at the trends in these key areas can help you establish a baseline of expectations for your program. Historically, referral bonuses have been attached to hard-to-fill jobs. This generally meant bonuses were saved for supervisory, management, and executive positions, with exceptions often made for other highly skilled jobs or ones that remain vacant for a long period of time. A number of companies continue to operate with this model, but more and more, every type of position has the potential for a referral bonus. In fact, the overwhelming majority of lower level jobs have a referral bonus attached to them. Around 90% of those companies that offer referral bonuses give them for all positions from secretaries to middle management, while only two-thirds give a referral bonus for executive positions. Almost all companies with referral bonus programs (98-99%) allow every employee below supervisor rank to receive referral bonuses. The majority of companies (85-91%) allow supervisors and middle management to receive referral bonuses. A significant drop-off occurs for top-tier employees. Only 62% of companies allow upper management to receive referral bonuses (only 62%), and only a third of companies permit executives to earn them. This area greatly depends upon your business and the availability of resources. That being said, many companies make a significant investment in referral bonuses because they have proven to be effective. Additionally, 70% of companies with referral bonus programs reported that bonus payouts have stayed the same from year to year, so once you establish your baseline, you can budget for future years with a fair amount of confidence. 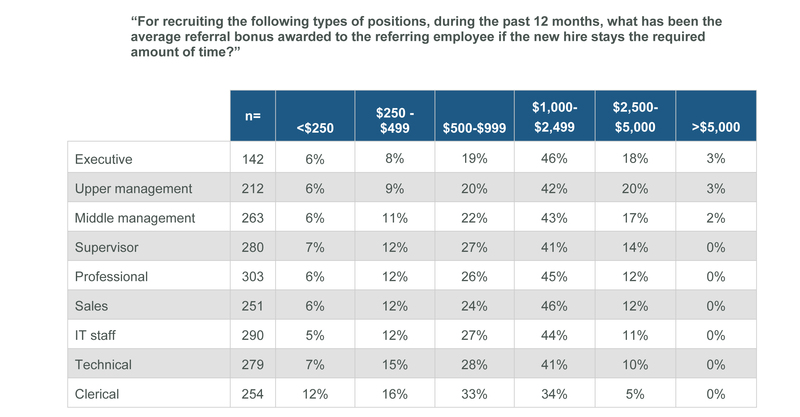 The following table gives a good overview of what the market does for referral bonuses. Despite what "everyone else is doing," sometimes following the crowd isn’t the best thing for your company. While nothing says thanks like cash, there are a number of other ways to reward employees for referrals. Gift cards, time off and recognition in front of peers are also powerful motivators. Consider your company’s needs, resources and culture, and then determine the path that best suits your goals and capabilities. This area is much more open to interpretation, as companies employ a number of practices regarding payment of bonuses. The first question is whether you want to pay the entire bonus amount in a lump sum or split it up. While most companies make a single payment, 28% of companies report splitting their bonuses into two separate payments. The first portion is generally paid out around the start date of the new hire and the second portion is paid at later date. More than 50% of companies pay the entire bonus amount within the first three months of a new hire, and 92% of employee referral bonuses are paid in full within six months. The most important thing to remember in this area is communication. However you determine to pay your employees for their referrals, make sure they clearly understand the process and the timing of their payment. Once an understanding is in place, be certain to pay bonuses in a timely manner according to your plan. Delaying an expected payment crushes morale and disengages employees from your referral program. A successful employee referral program encompasses much more than rewards, but finding the right rewards and the right way to administer them is a vital piece of the program puzzle. No one is in a better position to determine what’s right for your company than you are, and understanding what other companies are doing in these areas can help you find the right balance for yours.